At a time of uncertainty and business model overhauls, we examined recent earnings reports to gauge the state of the sector. Q2 highlights: During the quarter, Adtalem completed its sale of DeVry University to Cogswell Education. The deal raised concerns about DeVry's size and the acquirer's lack of a higher ed track record. Adtalem also finalized the sale of its Carrington College to a family-owned college in California, and it transferred its Ross University School of Medicine to Barbados. The Barbados facility includes a virtual anatomy lab and new patient care center, Adtalem CEO Lisa Wardell said on a conference call to discuss the quarterly report. Adtalem also saw enrollment gains at its Chamberlain University, which specializes in nursing and other health care programs. Analysts with Barrington Research expect growth in Adtalem's revenue and margins to accelerate in the fiscal year 2020 and beyond, according to an emailed client note. Q4 highlights: Even as course registrations fell during the quarter, American Public Education saw an 11% year-over-year increase in students using Military Tuition Assistance (TA). CEO Wallace Boston said during the company's earnings call that the increase was offset by a decline in students using veterans aid or federal student aid. However, the company said net course registrations for the first quarter of 2019 are up 8% year-over-year for new students and up 1% overall. BMO Capital Markets analyst Jeff Silber pointed out in a note that the Q4 enrollment decreases slightly beat the company's previous estimates and were "much 'less worse' than in the past," citing "very strong growth" in military TA enrollments. Silber added that he thinks the system "appears to have turned a corner with growth returning." Boston also said the company's marketing team has adjusted its ad spending to put "an even greater emphasis" on military veterans. "[W]e have utilized new lead scoring methodologies, enhanced geographic recruiting focus and deployed new lead nurturing strategies to increase engagement and enhance the prospective students' decision process," he said. *This figure does not include the Hondros College of Nursing, which enrolled 2,110 students as of Dec. 31. Q3 highlights: At the close of 2018, Bridgepoint enrolled a total of 38,153 students, down 6.3% from a year ago. Income declined with revenue and enrollment, with the company's operating loss more than doubling from $5.9 million in the year-earlier period and net loss widening from $5.1 million loss a year ago. New enrollment declines, however, slowed year-over-year by 7% and cohort retention improved by 2%, CEO Andrew Clark said on a conference call. In a regulatory filing for its fiscal year ended Dec. 31, the company attributed the enrollment declines in recent years to an improved economy, heightened regulatory scrutiny and a decision to temporarily stop enrolling new students using GI Bill benefits in late 2017 and early 2018. Bridgepoint is among the for-profit college operators looking to spin off its college assets into nonprofits and remain as a services company. The company recently finished transferring its University of the Rockies programs to Ashford University, which the company intends to convert into a nonprofit public benefit corporation. The conversion received IRS sign-off and is winding through an extended approval process with Ashford's accreditor. As it looks to overhaul its model, Bridgepoint has added executives. In February, it brought in a new chief strategy officer to lead acquisition plans. The month before, it added a vice president of learning services. Late last year, the company hired as its new chief operating officer the founder of an online program manager. Bridgepoint also recently cut a deal to acquire coding boot camp specialist Fullstack Academy for $17.5 million cash and 4.75 million shares. Bridgepoint has been the subject of several probes around its past practices, including investigations by the attorneys general of California and Massachusetts, and the U.S. Department of Justice. Q4 highlights: New student enrollment at the company's Colorado Technical University (CTU) increased 7.1% for the quarter ending Dec. 31, which saw income bounce back after it posted a $44.4 million loss in the year ago-period. CEO Todd Nelson said on a call with analysts that CTU's growth was due to "a strong increase in productivity" at its Illinois and Arizona student support centers, which in turn was driven by onboarding and student outreach initiatives, as well as staff training and development. Career Education attributed its overall enrollment declines to a redesign of American InterContinental University's (AIU) academic calendar, which itself contributed to a nearly 31% drop in new student enrollment at AIU for the most recent quarter and a 9.8% decrease across the company. Management said they expect the calendar changes will ultimately to lead to "significant growth" in AIU's enrollment in the first quarter of fiscal 2019. New student enrollment fell nearly 31% at American InterContinental University during the most recent quarter. Q4 highlights: Kaplan Higher Education's (KHE) steep revenue decline is largely the result of the completed sale of its domestic higher ed business to Purdue University last year. The past 12 months also saw KHE's operating loss widen from $360,000 to $3.4 million. The unit now acts as a service provider to Purdue University Global and other institutions. During the 2018 fiscal year, the company recorded a $16.8 million service fee from Purdue Global, a figure that gets assessed based on KHE's ongoing agreement with Purdue. KHE's operating expenses declined 32% year-over-year to $70.4 million in Q4, and they fell 21% in fiscal 2018. The company is working through a series of divestitures, including the recent completed sale of the University of St. Augustine for Health Sciences for $400 million to Altas Partners, a Canadian private equity firm. Laureate also considered selling the Minneapolis-based online Walden University, but it opted to keep it and focus on online education and its ground-based schools in Latin America. CEO Eilif Serck-Hanssen described the moves in a conference call as a "simplification of our portfolio to a core set of markets, where we have scale and strong competitive positions." That has helped reduce debt and lift margins. 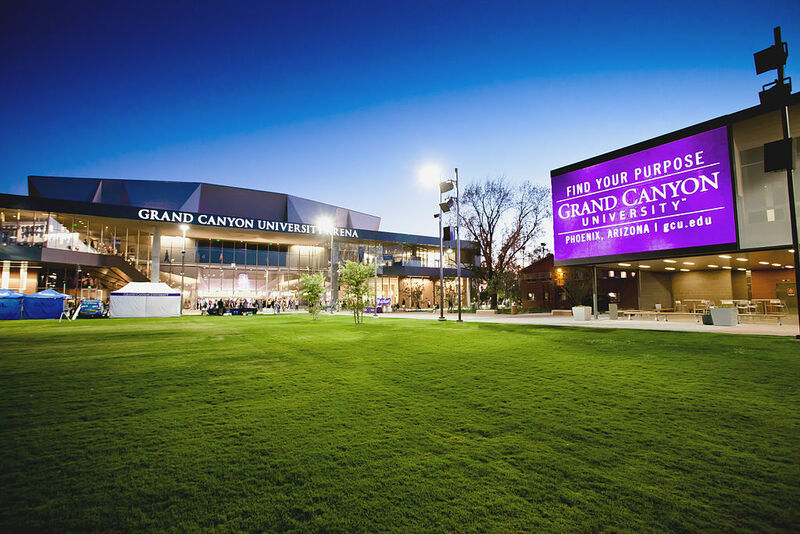 Q4 highlights: Grand Canyon's shrinking net revenue during the quarter reflects the company's transition to a services provider after spinning off Grand Canyon University (GCU) as a nonprofit last year. The company receives 60% of GCU's tuition and fee revenue and in return provides technology, academic, counseling, marketing, communications and other support services to the university. Grand Canyon CEO Brian Mueller said during an analyst call that comparable service fee revenue would have been $162.9 million in Q4 2017 (as compared to the $177.5 million logged in Q4 2018). During fiscal 2018, enrollment at GCU increased 7.8% to 97,369 students. Until last fall, GCU was Grand Canyon's only client. Over time, Grand Canyon Education (GCE) is expected to partner with more institutions, though none that compete with GCU. "The goal is to find partners that want to combine the strength of their local or regional brand with GCE's capability to execute at high levels from an operational perspective," the analysts said. They also noted the transaction gives Grand Canyon a "lower regulatory risk profile." Its $362.5 million acquisition of Orbis Education Services, an online program manager that focuses on healthcare education, expanded GCE's reach and clientele. Grand Canyon is expected to generate $87.7 million in revenue in 2019 from the Orbis acquisition, analysts with Barrington Research said in a note. GCU's nonprofit conversion has raised some eyebrows across higher ed, particularly because Mueller also serves as president of the university. Education Dive has previously reported on the inherent concerns and challenges as for-profits seek cover from regulatory scrutiny as nonprofits. Grand Canyon Education recently spun off Grand Canyon University as a nonprofit. Q2 highlights: In January, National American signaled in its most recent quarterly report that it might not make it through the next 12 months. At the close of the quarter ending Nov. 30, it had $530,000 in cash, about 10% of what it was a year ago. Working capital went from $4.4 million in November 2017 to negative $8.7 million in the most recent period. Its liquidity could become even tighter with an $800,000 loan payment due in May. The company's operating loss also went from $3.6 million to nearly $11 million year-over-year, and its net loss went from about $3.8 million to $11.3 million. The company has sold planes and cut $1.5 million in annual payroll costs to steady its cash position. It is also moving quickly to close physical campuses and become a primarily online education provider. National American closed 13 campuses during the quarter. Another 14 are open but teaching out students. It has also stopped enrolling new students in 34 of its 128 programs. *Only counts revenue from academic operations. Q4 highlights: Bringing together Strayer and Capella universities last year helped double Strategic Education's revenue in Q4 and boosted its net income — from a net loss of $6.5 million in the year-ago period to net income of $22.5 million — and operating income as well. By the end of the period, Capella and Strayer universities enrolled a combined 90,856 students, with both colleges growing enrollment. Helping to push Capella's enrollment is FlexPath, a subscription-based competency-based education delivery model that allows students to move through coursework at their own pace. Strategic Education said in a press release that FlexPath now accounts for 28% of total enrollment in Capella's bachelor's and master's degrees. CEO Karl McDonnell said during a conference call that Strayer and Capella are "performing at levels not seen in nearly a decade," and that the company is on track to finish integrating the two systems this year. The company plans to open Capella learner support centers, pending regulatory approval, in Atlanta and Orlando, Florida, in the first half of this year. McDonnell said Strategic Education is also researching physical sites so the company "can be in a position to open additional locations in 2019 should the two test locations perform well." Strayer also hopes to open between six and eight new campuses in 2019. Another benefit of the merger, the company is deploying Strayer's artificial intelligence technologies to Capella, McDonnell said. Used for 50% of Strayer's seats, the features have helped raise continuation rates, McDonnell said.